Morella faya, commonly called the fire tree, is a native to the Azores, Madeira Islands and the Canary Islands. It has been introduced to several places including Hawaii, New Zealand and Australia. This fast growing tree, whose dispersal is facilitated by introduced frugivorous birds, is capable of rapidly forming dense stands and has a negative effect on the recruitment and persistence of native plant species. 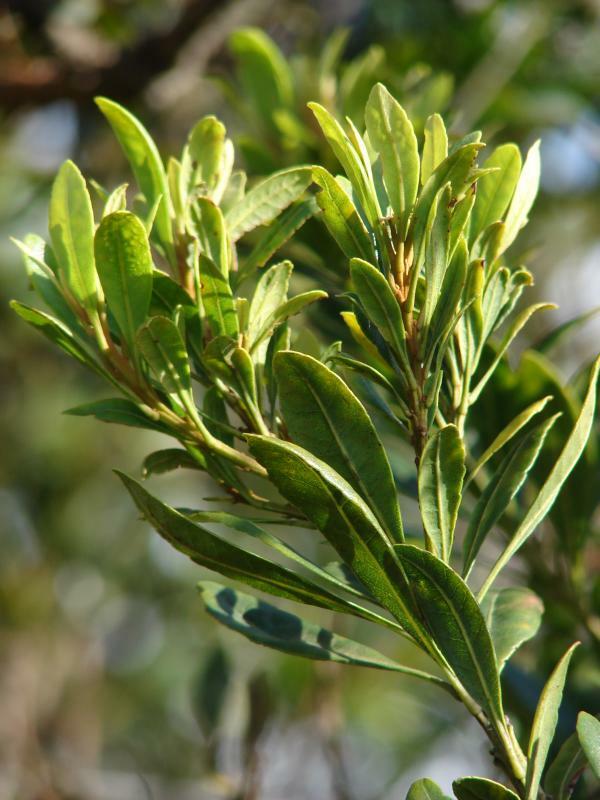 The fire tree is an evergreen shrub or small tree that usually grows around 8 metres tall. It has been reported as growing to heights of approx. 17mtrs (50 feet) in some areas (Benton, 2002). Stem and branches of the fire tree are covered with reddish peltate hairs. 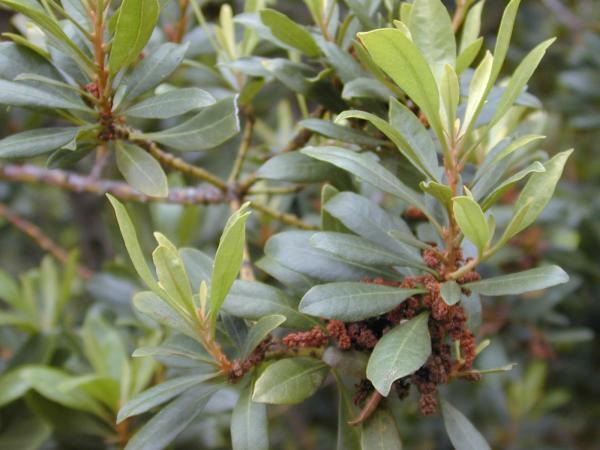 Leaves are coriaceous, oblanceolate, 4-11cm long, 1-2.5cm wide, and have glandular dots that are inconspicuous (PIER, 2002). Leaves are dark green, shiny, smooth, aromatic, and alternate along the stem. Flowers are usually branched catkins borne among leaves of the current year's growth. Male flowers have four stamens and occur in small hanging clusters near the branch tip. Female flowers, also grouped in small hanging clusters, occur in threes, further from the branch tip. Fruits of fire tree are small, and red to purple when ripe (Benton, 2002).M. faya is considered to be dioecious, but \"male\" plants still produce some fruit and \"female\" plants a few male inflorescences (PIER, 2002). The time-lag between the lava flow formation and Morella faya colonisation appear to be much shorter on Hawai‘i than on the Azores, (Binggeli, 1997). M. faya has several characteristics of a successful invader including its early reproduction, rapid growth, ability to fix atmospheric nitrogen, high fecundity and despersal by frugivorous birds. In Hawai‘i the main dispersal vector is a non-native silver-eye, Zosterops japonica, of which there are 3 species in Australia with wide ranges. Should M. faya become naturalised in Australia these bird species would be the most likely dispersal vectors. Fire tree is known to adapt to a wide range of habitats and soil types. In Hawai‘i it has invaded wet and mesic forests where it forms dense, monotypic stands, it is reported to be spreading over drier sub-montane forests (D'Antonio and Mack, 2001) It occurs in recent volcanic cinder deposits and various types of native forest, and is most abundant on steep slopes, in seasonal montane forests, pastures, and roadsides (Benton, 2002). In Volcanoes National Park in Hawai‘i, the main infestation occurs at 1250m, and although it rapidly forms dense monotypic stands it does not readily invade closed, late-successional native forest (Binggeli, 1997). Probably introduced for ornamental purposes in the early 18th century by colonists from Europe and Asia (Seibold, 2000).Probably introduced for medicinal purposes in the early 18th century by colonists from Europe and Asia (Seibold, 2000). Recommended citation: Global Invasive Species Database (2019) Species profile: Morella faya. Downloaded from http://www.iucngisd.org/gisd/species.php?sc=100 on 22-04-2019. Morella faya is capable of rapidly forming dense stands and has a negative effect on the recruitment and persistence of native plant species (Walker andVitousek 1991). M. faya an actinorrhizal nitrogen-fixer alters primary successional ecosystems in Hawai‘i Volcanoes National Park [Hawai‘i, USA] by quadrupling inputs of nitrogen, the nutrient limiting to plant growth (Vitousek, 1990). Preventative measures: A Risk Assessment of \r\r\nMorella faya for Hawai‘i and other Pacific islands was prepared by Dr. Curtis Daehler (UH Botany) with funding from the Kaulunani Urban Forestry Program and US Forest Service. The alien plant screening system is derived from Pheloung et al. (1999) with minor modifications for use in Pacific islands (Daehler et al. 2004). The result is a score of 8 and a recommendation of: \"Likely to cause significant ecological or economic harm in Hawai‘i and on other Pacific Islands as determined by a high WRA score, which is based on published sources describing species biology and behaviour in Hawai‘i and/or other parts of the world.\"
Physical: Introduced frugivorous birds and feral pigs are important dispersal agents of fire tree seeds, management options should include control of these dispersal agents to limit further spread. Goats can also be used to control the fire tree. Chemical: Herbicide is the primary tool used for fire tree. Roundup (Glysophate based herbicide) was found to be the most efficient herbicidal treatment because of its effectiveness in undiluted form and through its rapid absorption rate (30-40 minutes). Research results concluded that injection of undiluted Roundup provided the least exposure to nearby non-target species. Environmental soundness is related to the chemical’s rapid inactivation in the soil by micro-organisms. In its undiluted form, Roundup can be used in small quantities (5-10 ml per tree). Tordon 22K was also effective in small quantities of undiluted form, however, absorption rate was intermediate (24-48 hours). Kuron absorption rate was slow (more than 1 week). Treatment of undiluted Roundup or Tordon 22K allowed for the reduction in treatment quantity. The smaller quantities of treatments necessary due to the elimination of a solution reduced the amount of total treatment needed out in the field, therefore reducing labour and transportation costs. The absorption rate of Roundup allowed for the rapid re-use of tube sections, which affected the amount of equipment needed in the field. Also, the absorption rate (30-40 minutes) allowed the field workers to leave the site shortly after application allowing for quicker site-to-site application. Injection of undiluted Roundup provided the least exposure to nearby non-target species. Biological: A moth Caloptilia sp. nr. schinella a native of the Azores and Madeira Islands in the eastern Atlantic where its natural host is M. faya was released in Hawai‘i in 1991 as a potential biological control agent (Markin, 2002). Phyllonorycter myricae (Lepidoptera: Gracillariidae) is also under investigation as a possible biological control agent at the Institute of Pacific Islands Forestry laboratory, Volcano, Hawai‘i. Botrytis cinerea is the first pathogen to be reported on the fire tree and is reported to cause widespread fruit rot. Fruit rot has been observed on trees of all sizes in a variety of habitats throughout the Hawai‘ian range. The authors of this study suggest that the selection of more aggressive strains or the introduction of large numbers of Botrytis-infested insect vectors early in the fruiting season may assist in enhancing biocontrol of the fire tree (Duffy and Gardner, 1994). The infected fruit were also found to be less attractive to birds, therefore lessening the spread of firetree (Seibold, 2000). Septoria hodgesii sp. nov a common fungal leaf pathogen of Myrica cerifera in the southeastern U. S has been identified as a potential biocontrol agent as it has been shown (by artificial inoculation) to be pathogenic on M. faya (Gardner, 1999). Informations on Morella faya has been recorded for the following locations. Click on the name for additional informations. Asner, G.P., and P.M. Vitousek. 2005. Remote analysis of biological invasion and biogeochemical change. Proceedings of the National Academy of Sciences (USA) 102(12):4383-4386. Summary: A study using airborne imaging spectroscopy and photon transport modeling to determine how biological invasion (specifically the nitrogen-fixing tree Myrica faya and the invasive understory herb Hedychium gardnerianum) altered the chemistry of forest canopies across a Hawaiian montane rain forest landscape. Asner, Gregory P.; Martin, Roberta E.; Knapp, David E.; Kennedy-Bowdoin, Ty, 2010. 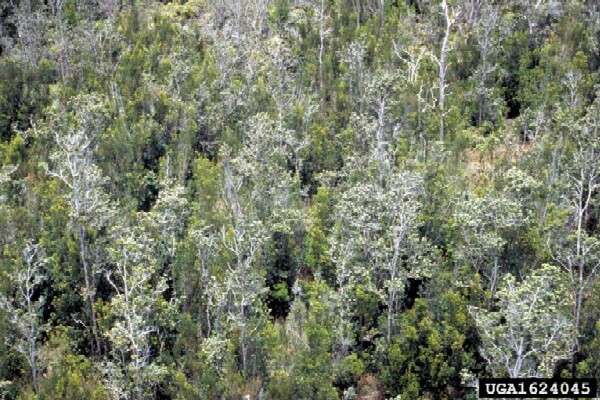 Effects of Morella faya tree invasion on above ground carbon storage in Hawaii. Biological Invasions. 12(3). MAR 2010. 477-494. Benton, Nancy. 1997. Fire Tree, Morella faya (Ait.) Wilbur. Plant Conservation Alliance, Alien Plant Working Group. Summary: Information on native Range, threats of the plant, background, habitat, reproduction and some management information. Boelman, Natalie T.; Asner, Gregory P.; Hart, Patrick J.; Martin, Roberta E., 2007. Multi-trophic invasion resistance in Hawaii: Bioacoustics, field surveys, and airborne remote sensing. Ecological Applications. 17(8). DEC 2007. 2137-2144. Summary: Report into the possiblity of using Botrytis cinerea as a biocontrol for M. faya. Summary: Nematodes wre found to be associated with the roots of the invasive tree. Gonzalez-Perez, Miguel A.; Newton, Craig; Sosa, Pedro A.; Rivero, Elizabeth; Gonzalez-Gonzalez, Edna A., 2009. 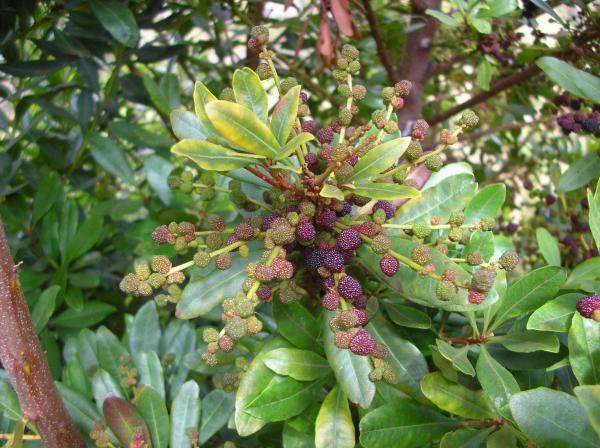 Characterization of six microsatellite loci in Myrica faya (Myricaceae) and cross amplification in the endangered endemic M. rivas-martinezii in Canary Islands, Spain. Genetics & Molecular Biology. 32(1). 2009. 117-120. Loh, Rhonda K.; Daehler, Curtis C., 2007. Influence of invasive tree kill rates on native and invasive plant establishment in a Hawaiian forest. Restoration Ecology. 15(2). JUN 2007. 199-211. Loh, Rhonda K.; Daehler, Curtis C., 2008. Influence of woody invader control methods and seed availability on native and invasive species establishment in a Hawaiian forest. Biological Invasions. 10(6). AUG 2008. 805-819. Summary: Report on the effectiveness of using the moth Caloptilia sp. Nr. schinella in controlling this invasive plant. Summary: Report into the search for a suitable biocontrol agent for use in Hawaii. Motooka, P. 2000. Summaries of herbicide trials for pasture, range, and non-cropland weed control-1999. College of Tropical Agriculture and Human Resources of the University of Hawaii at Manoa. Summary: Data published to assist applicators experimenting with herbicides for weed control. Available from: http://www.hear.org/pier/species/morella_faya.htm [Accessed 5 February 2003]. Seibold, Ryan. Controlling Fire Tree (Myrica faya) in Hawaii. Volume 6 - Fall 2000: Invasive Species & Ecosystem Restoration. Student On-Line Journal (Hort 5015/5071). University of Minnesota, St. Paul, Minnesota (USA). Department of Horticultural Science. Summary: Detailed management information. Information on Geography, Ecosystems effected and biology of the Fire tree. Binggeli, Pierre. 1997. 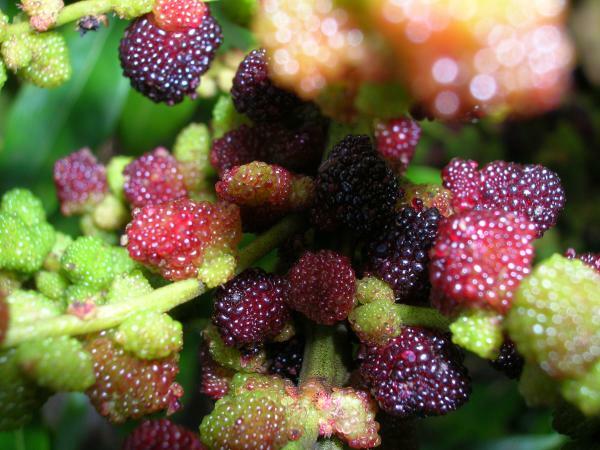 Myrica faya L. (Myricaceae). Summary: Information on Characteristics, Status (native and introduced regions), and ecological information also. Csurhes, S. & Edwards, R., 1998. Potential Environmental Weeds in Australia. Queensland Department of Natural Resources. Summary: Description of plant plus detailed information into the possible invasive patterns of M. faya. Summary: Report into the possiblity that another non native plant has a negative impact on the newly arrived Myrica faya. Hawaiian Alien Plant Studies (HAPS), 1998. University of Hawaii, Botany Department. Summary: Distribution and some general information. Summary: Report into the most common foragers on the Myrica faya tree. Summary: Myrica faya was found to promote the localised increase in an invasive invertebrate s abundance. Meyer, J.-Y. 2000. Invasive plants in the Pacific Islands. In: The Invasive Species in the Pacific: A Technical Review and Draft Regional Strategy. Sherley, G. (tech. ed). Published in June 2000 by the South Pacific Regional Environment Programme (SPREP). Summary: Resource that includes the distribution of invasive species throughout the Pacific Islands. Mueller-Dombois, D and Whiteaker, L.D. 1990. Plants associated with Myrica faya and 2 other pioneer trees on a recent volcanic surface in Hawaii Volcanoes National Park USA. Phytocoenologia. 19(1). 1990. 29-42. Summary: Report into the behaviour of M. faya as a coloniser. Summary: Study into the spread of M. faya. Summary: A report into the history of infestation in Hawaii. Turner, D.R. and Vitousek, P.M. 1987. Nodule biomass of the nitrogen fixing alien M. faya Ait. In Hawaii Volcanoes National Park USA. Pacific Science. 41(1-4). 1987. 186-190. Summary: Investigation into nitrogen fixing behaviour of M. faya. USDA-NRCS (Natural Resource Conservation Service). 2005. Morella faya. The PLANTS Database Version 3.5 [Online Database] National Plant Data Center, Baton Rouge, LA. Summary: Available from: http://plants.usda.gov/java/nameSearch?mode=Scientific+Name&keywordquery=Morella+faya [Accessed 12 March 2006]. Vitousek, Peter M.; Tweiten, Michael A.; Kellner, James; Hotchkiss, Sara C.; Chadwick, Oliver A.; Asner, Gregory P., 2010. 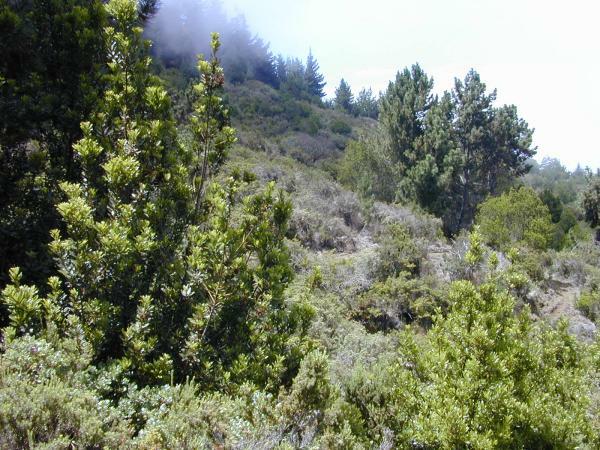 Top-Down Analysis of Forest Structure and Biogeochemistry across Hawaiian Landscapes. Pacific Science. 64(3). JUL 2010. 359-366. Summary: Report into the effect that M. faya has on primary successional ecosystems. Summary: Investigation into the effect of M. faya on a young volcanic area. Vitousek, P.M.; Walker, L.R. ; Whiteaker, L.D. ; Mueller-Dombois, D. and Matson, P.A. 1987. Biological invasion by M. faya alters ecosystem development in Hawaii USA. Science (Washington DC). 238(4828). 1987. 802-804. Summary: Report into the way that M. faya affects the ecosystem. Summary: Investigation into the effects of seed dispersal on germination success. Summary: Native tree species are being excluded from growing under the new invasive plants. Wilbur, Robert L., 1994. The Myricaceae of the United States and Canada: Genera, subgenera, and series. SIDA Contributions to Botany. 16(1). 1994. 93-107. Summary: Report into the avian visitors to M. faya trees. Native birds did not injest the fruit however non native birds did. Dr. Lloyd Loope s interest throughout his career has been to conduct and facilitate research to assist conservation of native ecosystems and species. A special current interest is to predict invasiveness of non-native plant species not yet widespread in Hawaii from their behavior elsewhere in the world.